Most companies believe that cash is the ultimate motivator, but we encourage you to consider a different method for motivating your employees, a Digital Debit Card rewards platform. Before looking at incentives, do you have an engagement and motivation strategy set in place for your workforce? A quick overview of a program: define your goals and objectives, adding in training and supplemental materials, then determine your rewards and incentives, ultimately offering those rewards to your team members who reach those goals. Once you determine your engagement strategy, you need to evaluate the different kinds of incentives you can offer. This question is defined by two distinct pathways; cash or non-cash incentives or rewards. Cash incentives are paid out through an employees paycheck, as a cash bonus or commission structure. Non-cash incentives are branded Digital Debit Cards that are reloadable and are directly tied to reaching a goal or selling a product. Here at E2, we build company branded incentive and rewards platforms for our clients to engage their employees, motivate their sales teams, and put their products on the forefront of their channel partners. Many company leaders are reluctant to give base salary increases outside of their annual employee review cycle. With a Non-Cash rewards, supervisors, managers, and peers can reward each other throughout the year for going above and beyond. 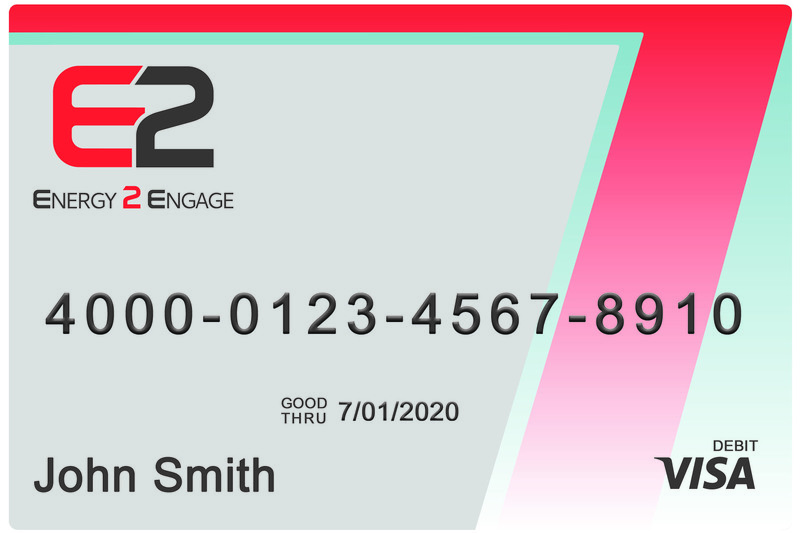 With E2's Digital Debit Card model, the rewards are invoiced to the company when spent by the participant - this is called 'breakage' and is a significant cost saving to our clients. Rewarding an employee for when they go above and beyond, hit sales incentive goals, bring innovative ideas to the company, complete training courses, or keep the workplace safe generates a high ROI (return on investment). The ROI can be seen from top line sales growth, reduced OSHA safety costs and violations, or finding additional ways for your company to find operational efficiency. In the 1990's, a watch or restaurant gift card may have been an appropriate gift. With today's instant-gratification landscape, a personalized reward is a much more effective way to spend company money to engage your employees. Those impersonal rewards have been replaced with the ability for participants to go Direct-To-Retail and shop at whatever retailer they choose. Have an employee who has been talking about a new TV to watch their favorite sports team? Or a colleague who wants to surprise their souse with a pair of sunglasses? Maybe its a parent looking to get a new bike for their kid? E2's Direct-To-Retail platform allows those participants to redeem their rewards for exactly what they want, whenever they want. When employees get rewarded with an E2 program, they're not waiting until the next quarter for the reward, waiting until the next payroll cycle, or even waiting 6-8 weeks for something to arrive in the mail, they're able to use the rewards immediately. Many participants wait to build up enough rewards to buy something more expensive while others use their rewards within hours - creating visibility and trophy value, thus leading to strong social reinforcement! When a participant receives a reward, they receive an automated email from your branded program telling them the rewards are live and ready to be spent. This email delivery approach saves time, printing expense, and shipping costs. Since the program is digital and we track the rewards used by participants, we provide comprehensive reporting, the status of what rewards have been spent, and unredeemed rewards. This data collection allows us to segment the data to determine who needs to be re-engaged, when to be re-engaged, and if a different method of engagement is needed (this is highly effective in a Channel Partner Incentive program). Who can be given Non-Cash Rewards? The ability to award someone a VISA Digital Debit Card reward is easy and straight forward from the employers side. E2 will work with you to create a strategy and a rewards platform branded for your company (which is where they retrieve their VISA Digital Debit Card rewards). Employers can choose to use a non-cash reward to motivate and incentive their internal employees with an Employee Engagement program. Programs can be structured by Service Anniversary, On-The-Spot, or Strategic Recognition. As part of the internal employee umbrella, sales individuals can be awarded through Sales Incentive Programs, hitting their quotas, supporting junior reps to reach their goals, etc. Whether it's a dealer, distributor, or independent contractor, they can earn rewards for selling your products to their installers or downstream customers. A Channel Partner Incentive Program is a comprehensive approach to ensuring your products and services stay at the forefront of their mind. Rebates paid out through checks can be delayed and lack excitement from the buyers perspective. With our Consumer Loyalty Program and rewards platform, your end customers will see a direct tie between your branded Digital Debit Card and the increased loyalty to your brand.